MacBook Pro 13” A1278. MacBookPro5,5 Mid 2009: MB990LL/A (2.26 GHz Core 2 Duo). MacBookPro5,5 Mid 2009: MB991LL/A (2.53 GHz Core 2 Duo). MacBookPro7,1 Mid 2010: MC374LL/A (2.4 GHz Core 2 Duo). MacBookPro7,1 Mid 2010: MC375LL/A (2.66 GHz Core 2 Duo). Brand new and original. Compatible model: MacBook Pro 13" A1342 A1278 (Mid 2008 - Early 2012) Type CPU Fan Brand Apple Compatible Model MacBook Pro 13" A1342 A1278 (Mid 2008 - Early 2012) Compatible CPU Brand Intel MPN Does Not Apply UPC 8710195018750. Brand new and original. Compatible model: MacBook Pro 13" Retina A1502 (Mid 2013 - Early 2015) Type CPU Fan Brand Apple Compatible Model MacBook Pro 13" Retina A1502 (Mid 2013 - Early 2015) Compatible CPU Brand Intel MPN Does Not Apply UPC 8710195018798. Pulled from working MacBook Pro mid-2012. Brand new and original. Compatible model: MacBook Pro 13" Retina Touch Bar A1706 (Mid 2016 - Early 2017) Type CPU Fan Brand Apple Compatible Model MacBook Pro 13" Retina Touch Bar A1706 (Mid 2016 - Early 2017) Compatible CPU Brand Intel MPN Does Not Apply UPC 6919609576929. Brand new and original. Compatible model: MacBook Pro 13" Retina A1502 (Mid 2013 - Early 2015) Type CPU Fan Brand Apple Compatible Model MacBook Pro 13" Retina A1502 (Mid 2013 - Early 2015) Compatible CPU Brand Intel MPN Does Not Apply UPC 8710195018835. Brand new and original. Compatible model: MacBook Pro 13" Retina Without Touch Bar A1708 (Mid 2016 - Early 2017) Type CPU Fan Brand Apple Compatible Model MacBook Pro 13" Retina No Touch Bar A1708 (Mid 2016 - Early 2017) Compatible CPU Brand Intel MPN Does Not Apply UPC 8710195018866. Brand new and original. Compatible model: MacBook Pro 13" Retina Without Touch Bar A1708 (Mid 2016 - Early 2017) Type CPU Fan Brand Apple Compatible Model MacBook Pro 13" Retina No Touch Bar A1708 (Mid 2016 - Early 2017) Compatible CPU Brand Intel MPN Does Not Apply UPC 8710195018729. Brand new and original. Compatible model: MacBook Pro 13" A1425 (Mid 2012 - Early 2013) Type CPU Fan Brand Apple Compatible Model MacBook Pro 13" A1425 (Mid 2012 - Early 2013) Compatible CPU Brand Intel MPN Does Not Apply UPC 8710195018828. Brand new and original. Compatible model: MacBook Pro 13" Retina Touch Bar A1706 (Mid 2016 - Early 2017) Type CPU Fan Brand Apple Compatible Model MacBook Pro 13" Retina Touch Bar A1706 (Mid 2016 - Early 2017) Compatible CPU Brand Intel MPN Does Not Apply UPC 8710195018705. Brand new and original. Compatible model: MacBook Pro 13" A1425 (Mid 2012 - Early 2013) Type CPU Fan Brand Apple Compatible Model MacBook Pro 13" A1425 (Mid 2012 - Early 2013) Compatible CPU Brand Intel MPN Does Not Apply UPC 6932782467181. Brand new and original. Compatible model: MacBook Pro 13" Retina Without Touch Bar A1708 (Mid 2016 - Early 2017) Type CPU Fan Brand Apple Compatible Model MacBook Pro 13" Retina No Touch Bar A1708 (Mid 2016 - Early 2017) Compatible CPU Brand Intel MPN Does Not Apply UPC 8710195018286. Brand new and original. 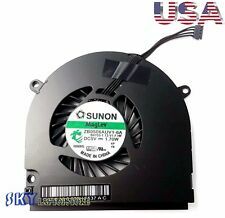 Compatible model: MacBook Pro 13" A1278 A1342 (Mid 2008 - Early 2012) Type Cooling Fan Brand Unbranded/Generic MPN Does Not Apply Compatible Brand For Apple Compatible Model For MacBook Pro 13" A1278 A1342 (Mid 2008 - Early 2012) UPC 8710195018637. Brand new and original. Compatible model: MacBook Pro 13" Retina Without Touch Bar A1708 (Mid 2016 - Early 2017) Type Cooling Fan Brand Unbranded/Generic MPN Does Not Apply Compatible Brand For Apple Compatible Model For MacBook Pro 13" Retina Without Touch Bar A1708 UPC 8710195018620. Brand new and original. Compatible model: MacBook Pro 13" Retina A1502 (Mid 2013 - Early 2015) Type CPU Fan Brand Apple Compatible Model MacBook Pro 13" Retina A1502 (Mid 2013 - Early 2015) Compatible CPU Brand Intel MPN Does Not Apply UPC 8710195018255. Brand new and original. Compatible model: MacBook Pro 13" A1425 (Mid 2012 - Early 2013) Type CPU Fan Brand Apple Compatible Model MacBook Pro 13" A1425 (Mid 2012 - Early 2013) Compatible CPU Brand Intel MPN Does Not Apply UPC 8710195018781. Brand new and original. Compatible model: MacBook Pro 13" A1278 A1342 (Mid 2008 - Early 2012) Type CPU Fan Brand Apple Compatible Model MacBook Pro 13" A1278 A1342 (Mid 2008 - Early 2012) Compatible CPU Brand Intel MPN Does Not Apply UPC 8710195018897. 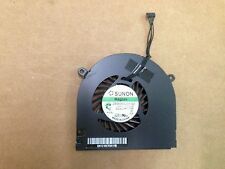 OEM Apple 13" MacBook Pro CPU Cooling Fan | A1278 | 2008 2009 2010 2012. 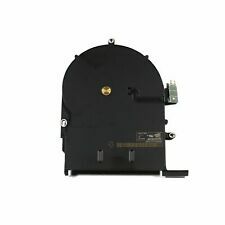 This is anUSED original genuine OEM Apple 13" MacBook Pro CPU 2011 Cooling Fan pulled directly from a working system. 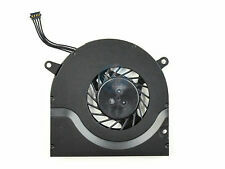 The cooling fan is compatible with 2011 and 2012 MacBook Pro 13" laptop. A1278 13" Unibody MacBook 2008 or Later models. MacBook "Core 2 Duo" 2.0 13" (Unibody). MacBook "Core 2 Duo" 2.4 13" (Unibody). MacBook Pro "Core 2 Duo" 2.4 13" Mid-2010. MacBook Pro "Core 2 Duo" 2.53 13" (SD/FW). Brand new and original. Compatible model: MacBook Pro 13" A1278 A1342 (Mid 2008 - Early 2012) Type CPU Fan Brand Apple Compatible Model MacBook Pro 13" A1278 A1342 (Mid 2008 - Early 2012) Compatible CPU Brand Intel MPN Does Not Apply UPC 8710195018316. Apple MacBook Pro 13’ late 2016 / 2017 non touch bar .... fan / Speakers / complete screws and connectors / Flex Cable WiFi antenna .... please see photos carefully .. fully insured 3 day shipping . Thanks for looking and enjoy . Brand new and original. Compatible model: MacBook Pro 13" Retina Touch Bar A1706 (Mid 2016 - Early 2017) Type Cooling Fan Brand Unbranded/Generic MPN Does Not Apply Compatible Brand For Apple Compatible Model For MacBook Pro 13" Retina Touch Bar A1706 UPC 8710195018682. Brand new and original. 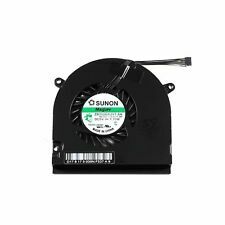 Compatible model: MacBook Pro 13" Retina A1502 (Mid 2013 - Early 2015) Type Cooling Fan Brand Unbranded/Generic MPN Does Not Apply Compatible Brand For Apple Compatible Model For MacBook Pro 13" Retina A1502 (Mid 2013 - Early 2015) UPC 8710195018675. Model # KSB0505HB / QE0120HFB411B. MacBook 13" Unibody A1278. MacBook5,1 Late 2008: MB467LL/A (2.4 GHz Core 2 Duo)MacBook Pro 13" Unibody A1278. 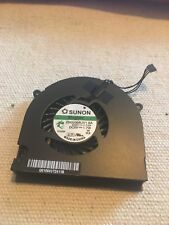 1 - CPU fan. 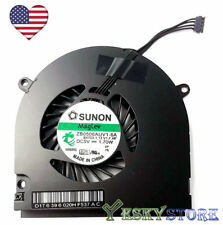 Replacing this part will quiet a noisy fan. Brand new and original. Compatible model: MacBook Pro 13" A1425 (Mid 2012 - Early 2013) Type Cooling Fan Brand Unbranded/Generic MPN Does Not Apply Compatible Brand For Apple Compatible Model For MacBook Pro 13" A1425 (Mid 2012 - Early 2013) UPC 8710195018668. Great Condition, Tested and Working. 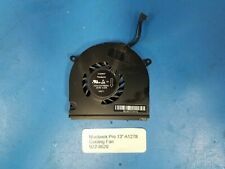 MacBook Pro 13" CPU Cooling Fan for Apple A1278 Laptop TESTED! FREE SHIPPING!